Sand Island Lighthouse will be getting its island back. 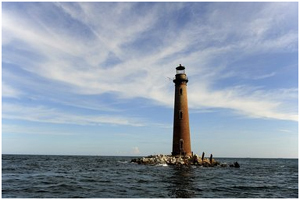 Decades ago, the island that gave Mobile's signature lighthouse its name disappeared below the waves, with erosion blamed in part on the dredging of the Mobile Ship Channel. Now, thanks to $6 million in federal funds aimed at mitigating BP's Deepwater Horizon spill, the U.S. Army Corps of Engineers has received approval to heap millions of cubic yards of sand around the lighthouse, beginning in March. The lighthouse has essentially been an island unto itself - a tall, narrow column of brick standing atop a heap of rocks surrounded by open water - for as long as most people can remember. But it wasn't always so. In the 1800s, Sand Island was more than 400 acres, according to historical records. Early lighthouse keepers had a two-story house and livestock that grazed on the island. In the intervening years, Sand Island and Dauphin Island both experienced heavy erosion that Scott Douglass, a University of South Alabama coastal engineer, links to the creation of the Mobile Ship Channel. The channel, Douglas said, disrupts the natural movement of sand along the Alabama coastline, starving both Sand and Dauphin islands. "The funds we got were to use (sand dredged) from existing federal navigation channels located on the Gulf Coast to mitigate the Deepwater Horizon spill," said Susan Rees, an environmental engineer with the Mobile corps district. "We designed a project that begins around the lighthouse and goes as far west as the money will carry us." The remnants of Sand Island are still present in the form of a large shallow area that stretches west from the lighthouse toward the Dauphin Island pier. The corps intends to use that shoal as the backbone of the new island. A long, narrow ridge of sand will be built up to a height of about 6 feet above the high tide line. "This is a step in the right direction. They are putting sand where Mother Nature would have put it if the ship channel weren't there," said Douglass. "This project will help restore the natural movement of sand." Rees said officials hope the island will ultimately be more than a mile long. Hal Pierce, with the Alabama Lighthouse Association, said the project was a major step toward saving the lighthouse for the long term. "We are delighted. It will give us the first safe docking at the lighthouse that we've had in years, so people will finally be able to visit," said Pierce, whose group has long advocated restoring the island. "If we're ever going to properly fix the lighthouse this will be a big help." Dauphin Island mayor Jeff Collier said the project had multiple benefits. "Not only is it going to help the lighthouse directly by stabilizing the foundation, but it is also going to benefit Dauphin Island, both as a wave break and by putting sand into the system," said Collier. "It is a common sense type thing to do. People will be able to slide their boats up on the island and visit the lighthouse. I just can't see a downside." Corps officials said a public notice for the project should be posted in a matter of days. A public comment period will follow.